UNHCR’s first round of cash distributions in the southern governorates of Yemen will reach 9,000 beneficiary households. Assessments and verification have now been completed. Just over half of the assistance will be received by families identified by UNHCR and partners as having protection needs, while the remainder will assist families with shelter needs. Cash transfers are planned as the primary means of assistance in UNHCR’s 2019 operations, which aim to deliver cash assistance to 150,000 Yemenis and 21,000 refugees. Cash-based programming supports local economies and allows beneficiaries to use the assistance to address their needs in ways that suit them best. In northern governorates, over 26,000 households have received cash assistance as part of the first round of disbursements in 2019. UNHCR partner, Jeel al Bena, distributed in-kind assistance to over 2,000 households newly arrived in Abs district (Hajjah Governorate). UNHCR and partners continue to see new internally displaced persons (IDPs) arriving in Abs district, ensuring that their needs are quickly assessed and verified so that core relief items (CRIs) and emergency shelter kits (ESKs) can be distributed appropriately. 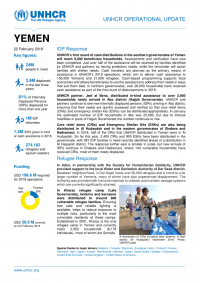 In January the estimated number of IDP households in Abs was 23,000, but due to intense hostilities in parts of Hajjah Governorate the number continues to rise. Core relief items (CRIs) and Emergency Shelter Kits (ESKs) are also being distributed in Al Hudaydah and in the eastern governorates of Shabwa and Hadramaut. In 2018, half of the CRIs that UNHCR distributed in Yemen were in Al Hudaydah. So far this year, 2,400 CRIs and 900 ESKs have been distributed in the governorate, with 381 IDP families in need recently identified ahead of a distribution in Al Hajjaylah district. The response further east is smaller in scale, but new arrivals of IDPs continue in Shabwa and Hadramaut, where 140 vulnerable households have received CRIs, most of them newly displaced. In Aden, in partnership with the Society for Humanitarian Solidarity, UNHCR provided support to the local Water and Sanitation Authority of Dar Saad district. Basateen neighbourhood, in Dar Saad, hosts over 50,000 refugees and is home to a far larger number of Yemenis, many of whom have also experienced displacement. The Authority was provided with fuel and materials to unblock and maintain sewage systems which are currently significantly strained. In Kharaz refugee camp (Lahj Governorate), lanterns and kerosene were distributed to around 900 vulnerable refugee families. Ensuring that safe and reliable lighting is available, helps to reduce exposure to multiple risks, particularly to the most vulnerable residents of these camps. Established in 2001, Kharaz is the only refugee camp in Yemen and currently hosts 2,353 households (8,178 individuals), most of whom are Somalis.